You know that scene in How the Grinch Stole Christmas when Cindy Lou Who sings “Where Are You Christmas?” Well, yeah. That’s happening. Christmas has been elusive this year, and I’m not sure what happened. I was so beyond enthusiastic about Thanksgiving, compensating for missing my family by making the Newlywed Halter’s first meal an experience to remember. But now, who knows what’s going on? I’ve gotten most of my shopping done – early, in fact. Giving presents is probably one of my very most favorite things to do, yet everything is still unwrapped and hidden around the house. Normally, I would be baking up a storm, singing Christmas carols along with Pandora while flinging flour everywhere. But Bill doesn’t eat sweets, and when no one will enjoy them but me… Well, that sounds more like a recipe for holiday chub and a whole lot of lonely sugar binging. So I’ve made healthy Caramel Apple Oatmeal Cookies, but it’s just not the same. And then, of course, there is the fact that it was sunny and 75 degrees out today. I would never complain about that, unless it was both December AND my world was lacking some holiday spirit. So what’s a girl to do when her heart isn’t as light and her spirit isn’t as bright as it should be? My mom called today, exploding with excitement that OMG Michael’s had decided to mark all of their Christmas decorations down to 70% off, and OMG my stepdad was going to be something just short of livid when he comes home to see that Wonderland that I’m sure is my mother’s house. Funny thing though, is that it just so happened that I was at Michael’s this very morning, albeit 429 miles away, and I not so much as noticed the Christmas extravaganza. And I’m observant. 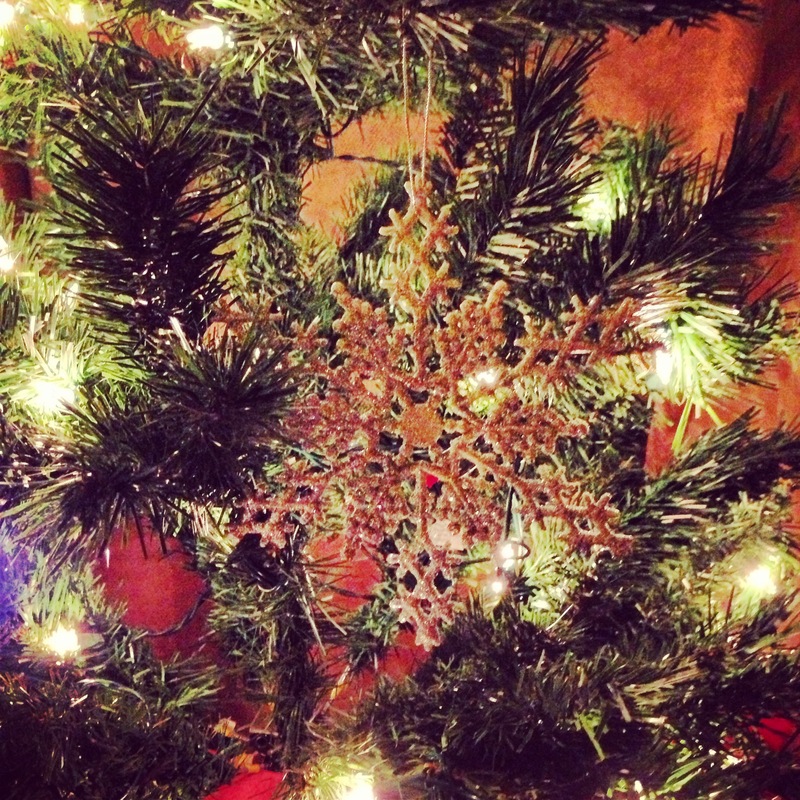 And usually squee myself over things like garland, glitter, and little reindeer statuettes. She told me to go. I told her I’m broke. She told me to decorate. I told her we only had a week before we leave for vacation. She told me to put out our fake tree. I told her it was small and pathetic. She told me to knock it off, as much as my sweet little mother would tell me to knock it off. I tried. It didn’t work. Talk about a Scrooge. Sheesh. But it turns out that trimming my pathetic fake tree all alone, by myself, on a dark Sunday night with only a week left before we abandon it was exactly what the doctor ordered. Every year it seems like it takes a grand gesture, a Pinterest-sized effort, holiday rat race to get in the spirit, and for some reason, I just haven’t had it in me this year. And it’s so easy to forget that even the smallest gesture can bring big changes. Proof? The lights were already on it. 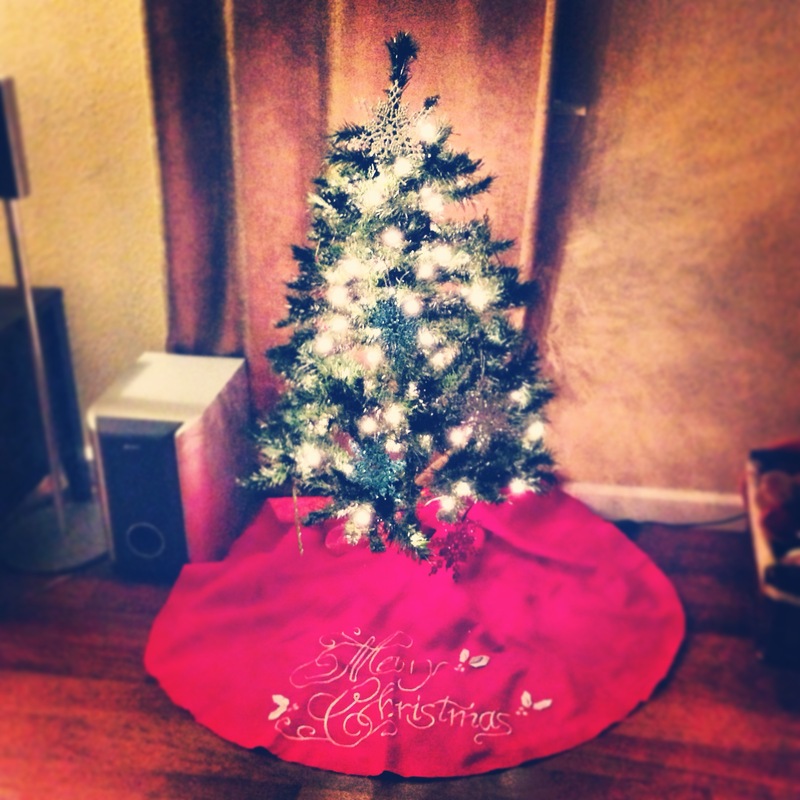 I stuck 8, maybe 10, obnoxious glittery snowflakes on it, which clash tremendously with the bright red tree skirt. This is the only decoration I currently have in my house, and you know what? That’s okay. It’s been a big year, and I’m giving myself permission to bow out of the pressure to be the domestic queen of the holidays. 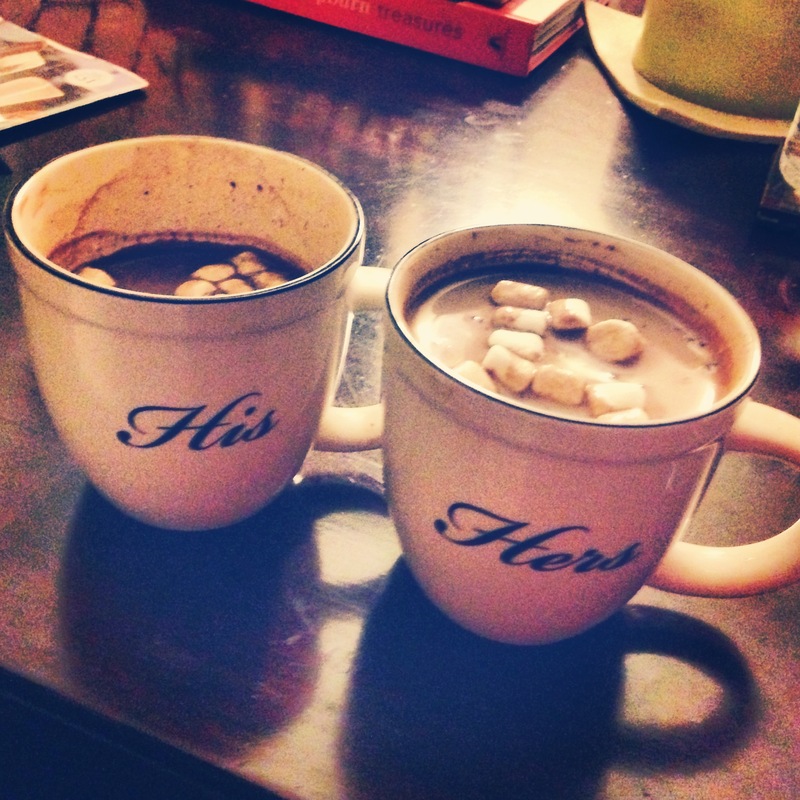 Honestly, I’m just so content to sit back with Billy and drink some hot chocolate from our cute His and Hers mugs without worrying about comparing myself to everyone around me. Doesn’t that just look so (devastatingly-ordinary-and-oh-so-vanilla-deep-sigh) NICE? It’s strange how being at peace with an underwhelming Christmas performance can ironically stoke that internal holiday cheer fire. All of a sudden that heart we were talking about earlier is a little lighter. And those spirits we mentioned? Well, they’re – you guessed it – a little brighter. So there it is. Let’s all just sit back and enjoy everything we are, instead of worrying our little Grinch hearts out over everything we’re not. Happy (half-assed) holidays everyone! It may just be the best one yet.